A tightrope. The audience stares breathless. 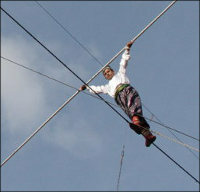 Tension is growing with each and every split second as 4-year old Sarvarbek who’s made it in the Guinness Book of records as the youngest rope-walker in the world is balancing high up on a tightrope, 50 feet above the ground. He is going to end his trip momentarily and make the audience roar. The Kamilovs from Uzbekistan, a rope-dancers’ dynasty that has now moved to Saint-Petersburg astonishes the Russia’s northern capital with its shows. Uzbek equilibrists keep on shocking the audience with their tightrope walking miracles, acrobatics, kettlebell juggling and an amazing feat of strength by a mighty athlete who lies down under a wooden platform and lets a Russian automobile drive over his chest. The Kamilovs moved from Uzbekistan to Russia in 1995, and have been touring all over the world since then. This large family of 20 persons is led by Ravshan Kamilov who has got 11 children and 6 grandchildren, all taught to rope-dance since the age of two. In Ravshan’s own words this art that dates back 300 years is widespread and popular in Uzbekistan. According to the “San’at” magazine from Uzbekistan, performers that used to be trained in certain parts of the Central Asia would travel across the regions and were quite popular in Iran, Turkey and in Caucasus. Every show by the Kammilovs is preluded by the music of sonorous karnays (long Uzbek trumpets), whereupon the fearless tightrope walkers perform their mortal stunts. Meanwhile, Rashan Kamilov’s daughters proceed on to cooking the traditional Uzbek rice pilaf to treat the audience after the most amazing show is over. So while the Petersburgers partake of the most delicious pilaf, the artists pack up their gears and get ready to overmaster another audience.